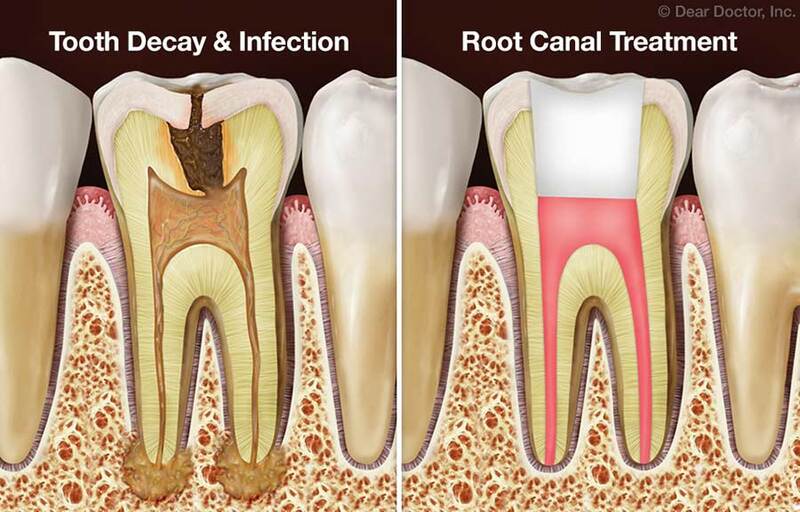 If tooth pulp becomes acutely inflamed or infected — because of decay or injury for example — the tissue will need to be removed in order to save the tooth and stop the infection from spreading. As an adult, you don't actually need the pulp — its primary use is to aid in tooth development during childhood. After numbing the area, a tiny hole is made in your tooth to access the pulp chamber and canals. The diseased tissue is removed, and the pulp chamber and the canal(s) are disinfected all the way to the root end(s). Teeth in the front of the mouth have one root and generally one canal; back teeth have two or three roots and generally three or four canals. Those canals and the pulp chamber are filled with an inert, biocompatible material, and sealed with adhesive cement. The access hole will receive a temporary filling.